No, thank you. The standard gift set is perfect! Give the gift of health and let us do the eco-friendly wrapping for you. 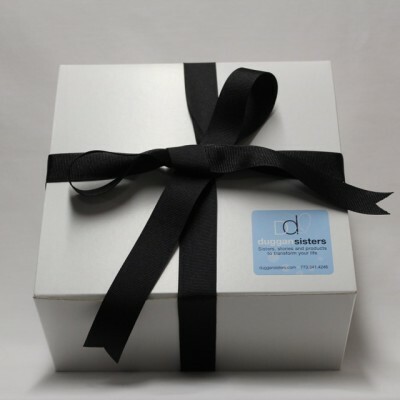 We offer 100% recycled Green Way® gift-wrap tied with a luxurious grosgrain ribbon for these exclusive Duggan Sisters boxed & tissued gift sets. This five-piece gift set includes everything you need to get started with the full collection of our good LIFE solutions. Please select your preference of regular or extra strength deodorant. In addition to our full deodorant tool kit, this unique gift set is enhanced by an introduction to our home spa smartsoak. An everywhere travel size container for showering away from home. 2.25 oz. - containing 90 applications of lifestinks dry deodorant. A stinkstink deodorant booster. Extra odor control for the big stinkers. 110 applications of pure deodorant oil. Plus a lavender smartsoak® to encourage restful sleep and peace of mind. from recycled banana peel for Duggan Sisters gift sets. Explore all our gift set options.